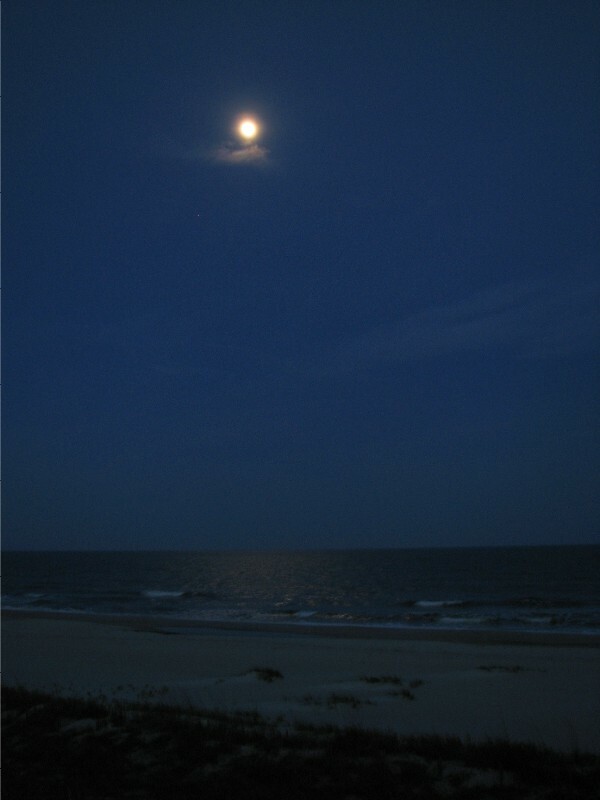 Moon over the ocean at Ocean Isle Beach, North Carolina. May 6, 2009. This is my post for Skywatch Friday, a meme for sharing views of the sky from all over the world. Last week a couple hundred people shared their view of the sky. To see more, or to join and share your own photos of the sky, click HERE. Last week I posted a picture of a moonrise over the ocean at the beach while we were on vacation. We were treated to a beautiful show for three nights, and of course I took more than one picture. I couldn’t resist posting another picture of the moon over the ocean. We were enthralled by the reflection on the water, which you can better see by enlarging the photo above. This entry was posted on May 22, 2009 at 3:45 am and is filed under SkyWatch Friday. You can follow any responses to this entry through the RSS 2.0 feed. You can leave a response, or trackback from your own site. I would think this is a difficult image to capture..but you did a very nice job! George: What a neat capture of the sky. Another great photograph of the moon and sky and beach. Beautiful when you enlarge it! Thanks for ypur support George. Sorry I’ve been vacant from your comment box lately. I shall try to resume my visits to my favourite blogs a bit better but now we’re off to the cottage soon. Just wanted to say I’ve not forogotten you and your picture above is magical. Full of that mystical feel of a moonlit sea. Love the colours. Oh that is lovely George! Would love to see it in person. So peaceful, I just love this pic. This photo reminds me of why I so want to move to North Carolina. So very peaceful, can almost feel I am there. Such a pretty shot George!